Grade Weighting is an optional feature a teacher may enable in SchoolLoop's Gradebook. Since weighting requires the use of categories, teachers should first create the categories they plan to use. This information will be used by teachers who wish to learn how to configure grade weighting. 1. Click the Settings link (the gear icon) near the top right corner of the page, from any page in the portal. 2. Select a Gradebook from the Gradebook Settings section of the next page. 4. Enable weighting by checking Yes. 5. Enter the weight value (percent) for each category. Use 0 for categories a user does not wish to use for this Gradebook. Make sure the sum of all weights is exactly 100. 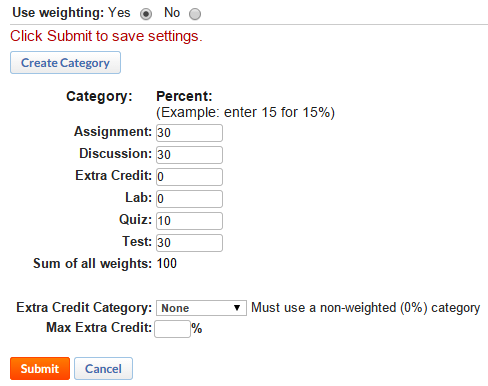 After successfully submitting the desired weighting configuration, changes are reflected in the Gradebook.